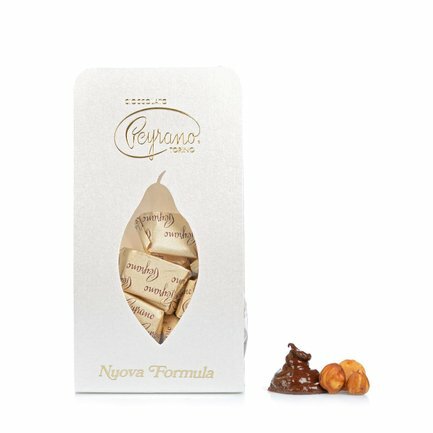 With its Giandujotti Mignons Peyrano has encapsulated all traditional goodness of the classic Turinese confections in miniature to provide the perfect carefree indulgence. Made according to the Nuova Formula, in which milk is added to the traditional recipe ingredients, these giandujotti immediately produce the sumptuous and overwhelming notes of Piedmont IGP hazelnuts, which make up 28% of the ingredients. The confections are soft on the palate, melting easily with a satisfyingly velvety texture. The ideal way to savour the sweeter side of Piedmont tradition. Excellent when enjoyed on their own, and simply divine with your favourite blend of coffee. Ingredients sugar, Piedmont hazelnuts IOGP 28%, cocoa, cocoa butter, milk powder, emulsifier: (soya) lecithin, Bourbon vanilla pods. May contain traces of nuts. For more information on product labels, please contact our Customer Service department. The information on the labels of the products may vary for reasons beyond our control, therefore, there may be discrepancies between the information on the site and that on the products delivered. Please always check the information on the product before consumption or use.